The second chapter builds on the first, continuing to lift Jesus higher in Paul’s letter to the Hebrews. Brother Branham explained how the prophets are angels, or messengers, to bring the Word to the people. He went further to say that we are all messengers of good news or bad news. Towards the end of the chapter, we learn that Jesus became flesh so He could sympathize with (succour) the trials and tribulations we suffer. Our Lord did not come to earth as an Angel, He came as a man so he would know what it was to feel temptation or sickness. That should make us all feel good! Jesus knows the pain you feel, He can save and He can heal; Take your burden to the Lord and leave it there. Now the Gospel Waters get deeper in Chapter 3. We learn about the provocation, how we are different from the world, and we hear many encouraging testimonies from Brother Branham. Who did Brother Branham believe would finally turn into the mission fields somewhere, because America doesn't want the Gospel? Brother Branham said, "Love would be so far away, in the last days; the only love there would be left, would be between the _______ of God's people." What did Brother Branham say we're just beginning to get over into as we're ending up in the 3rd, and beginning in the 4th chapter of the glorious Book of Hebrews? There's not one cross-up in the entire Bible. "There is something about the... where you go, what church you go to, and what teacher teaches you. Did you know that? It, it's got something to it." Who does Brother Branham use as an example of this? You don't know who that is you're testifying to. You just cast your lot, that's all, give him the Word. _______ takes the choice. Later on, when Paul wrote letters, his eyes bothered him so bad from that Light, until he _______. Who was Brother Branham with one day at the river when he kept saying "I can swim."? The man just took the oar and pushed Brother Branham out in about ten-foot of water. They had _______ who was setting there, taking It down just as Paul was preaching It. We're getting It by _______, and these _______ go over the world to show that It is the Truth. "While it is said, To day if ye will _______, harden not your hearts, as in the provocation." We don't want the rotten things of the world no more. Christ has made us become _______; like civilization has made us become _______. God hates to bring you in trouble. He loves to keep you out of trouble so He don’t have to see what you'll do about it. Some through the water, some through the _______, Some through deep trial, but all through the _______. When God does anything, He _______ the nation to grab It. What's the matter with these big churches today? The Bible said, "Come out from among them, and be ye _______, saith the Lord, and I will receive you." The _______ is when God shows Himself and you disbelieve It, you won't listen to It. Each one of them _______ knowed just what the other one had said, and knowed that their Spirit was the same. It's all a spiritual, revealed Truth laying right there, and it takes a _______ mind to catch It. Where is your real altar? Here are the current quiz results for Hebrews, Chapter Three. 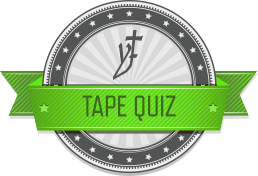 Anyone taking the quiz after Sunday, October 5, 2014 will not have their score posted.